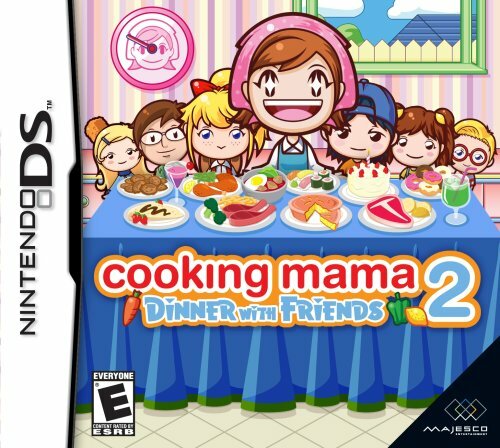 Mama returns in the new game for the DS, Cooking Mama 2: Dinner with Friends. This time she has invited friends to help taste and judge the items coming from the kitchen. See if your home-cooked meals can stand their critique. Chose from four gameplay modes: Cook with Mama, where even if you make mistakes Mama will help you complete your recipe. Let's Cook, you are on you own and it's up to you to satisfy nine friends who will try out you creations and judge you based on how they taste. Cooking Contest allows you to play up to 3 friends online with only one game card. Change design gives you the opportunity to customize your kitchen decor or background you unlock as you move through the game.